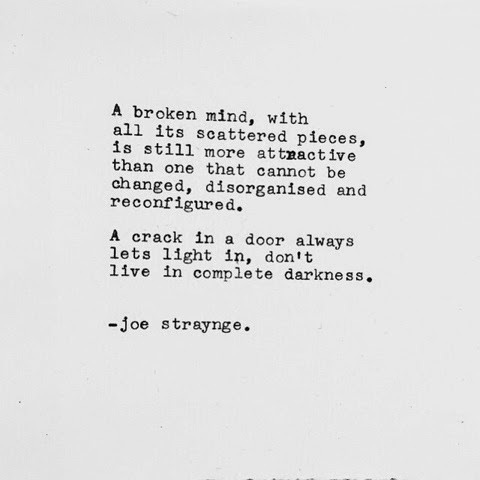 I recently came across poet and writer Joe Straynge online, I instantly fell in love with his beautiful, raw words... Sometimes the emotion behind those words is so much it feels intimate, painful almost to be a part of reading. That's what I love about language, and writing.. The power it can have when we put together certain words, how it can be an outlet, a tool for connection, a voice that otherwise doesn't get heard. As we express, we relieve the thoughts caught up in our minds, and with some hope.. Those that we share those words with may find solace, may feel comfort, connection. Without always directly communicating, we are able to feel a little less alone in the world, and just a little braver. Tan says everything I could have said on this and more, so I feel no need to elaborate further. The conclusion simply being, we are never 'only' human.. We ARE human, beautifully imperfect, gloriously human beings. How wonderful. Somebody had left a comment on my friends blog reminding us of a famous and an all time favourite poem of mine, Our Deepest Fear, by Marianne Williamson.. I wanted to re-share it with you as the words, so beautifully, summarise everything. We ARE shining, powerful, great and glorious beings. Let all of your light shine through.